In 2016, 9.9% of the UK’s electricty was generated by biomass electricity. This counts towards our renewable energy targets, and is viewed by many as a clean, green source of electricity. However, Biofuelwatch, other environmental NGOs and leading scientists disagree: far from helping to reduce carbon emissions and making our energy system more sustainable, biomass electricity causes climate impacts which are commonly no better than those from coal burning, along with increased forest degradation and biodiversity losses. Yet biomass electricity receives strong support from the UK government. In 2016, energy companies received around £891 million in UK subsidies for generating electricity from bioenergy and the vast maority of that came from burning wood. We expect this figure to increase to over £1 billion annually in next few years as new biomass power stations come online which have been granted a higher subsidy rate under the ‘Contracts for Difference’ scheme. As a result of those subsidies, UK power stations burned pellets and woodchips made from around 15 million tonnes of virgin wood, plus an additional 1.1 million tonnes of waste wood. Of the virgin wood burned, 2.7 million tonnes came from the UK, mainly from conifer plantations, in 2016/17, and, in addition, Drax burned pellets made from 13.2 million tonnes of imported wood in 2016 and from 13.6 million tonnes in 2017. By comparison, the UK’s total wood production is only around 11 million tonnes a year. Between 2018 and 2020, two new large biomass power stations will start burning imported pellets made from another 6 million tonnes of wood between them. We campaign against subsidies for biomass electricity, and believe instead that the subsidy system should be reformed so that genuinely low-carbon renewable energy, such as wind, solar and tidal, and energy demand reduction is properly supported, rather than undermined as it has been recently. Read on to find out more or download our fully referenced briefing – to be updated soon. Can sustainability standards result in ‘good biomass’? Burning wood in power stations is no better for the climate than burning coal. In fact, the smokestack CO2 emissions from biomass electricity are even higher than those from coal (per unit of energy), because electricity generation from biomass is less efficient than that from coal. This is widely acknowledged, for example by the International Panel on Climate Change. The CO2 emissions from burning biomass are currently ignored by operators and the Government alike, on the assumption that future tree growth will sequester the emitted CO2. However, a growing volume of scientific studies shows this assumption to be deeply flawed. long-term reductions in soil and vegetation carbon stocks due to of more extensive or intensive logging as well as the conversion of natural forests to monoculture plantations. The climate impacts of biomass electricity are even worse when the substantial methane emissions from woodchip storage are taken into account. Although the climate impacts of biomass sourced through additional logging are the worst, scientific evidence shows that burning forest residues for electricity nonetheless results in significantly adverse climate impacts over a period of several decades. In summary, burning biomass produces a “carbon debt” exactly at the time when globally we urgently need to be reducing carbon emissions if we want to have any hope of preventing the worst impacts of climate change. We cannot put off meaningful emissions reductions any further. Instead of further logging forests and replacing them with monoculture plantations, this is the time we must conserve and expand them. As well as being essential ‘carbon sinks’, soaking up large volumes of CO2 that humanity emits every year, forests are also unique ecosystems, home to thousands of species. Biomass electricity in the UK is already causing destruction and degradation of forests. Most biomass in the UK is burnt in the form of wood pellets. The South-eastern US is a large and rapidly growing centre of wood pellet production and export; exports from that region to the EU rose from 1 million tonnes in 2011 to 4.9 million tonnes in 2015, and demand is only set to grow as plans for expansion are underway. 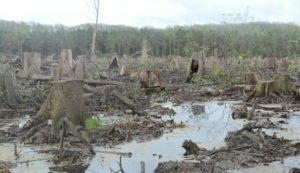 Studies from NGOs and in peer-reviewed scientific journals show that the logging of forests and conversion to monoculture plantations due to the growing wood pellet demand poses a serious threat to the old-growth wetland forests of the South-East. These forests are found within a ‘biodiversity hotspot’, and contain large numbers of rare and endangered species, including black bears, numerous songbird species, bats and butterflies. They also provide essential ecosystem services, such as purifying water and flood control. Most of wood pellets from the south-eastern US are exported to the UK. 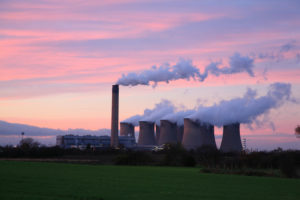 The largest customer is Drax Power Station in Yorkshire, the largest biomass power plant in the world, which in 2017 received £729 million in government subsidy. According to Drax Plc’s Annual Report for 2016, the power station burnt around 4 million tonnes of pellets from the US that year. As each tonne of pellets requires two tonnes of green wood, Drax burnt the equivalent of over 8 million tonnes of wood from the US. All of this came from pellet mills in the southern US, the majority from pellet mills owned by Enviva. 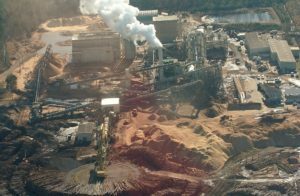 US conservation NGO investigations have shown logs from clearcut wetland forests in North Carolina being processed at Enviva pellet mills that supply Drax (see picture above). Processing residues and waste wood are often cited as potential bioenergy sources with no negative biodiversity impacts. However, figures contained in a US Department of Agriculture Report from 2012 show that 59.3 million dry tonnes of wood residues arose at timber-processing facilities in the US, but less than 1% of those were not used for other purposes and thus available for pellet production. Clearly the availability of processing residues and waste wood for bioenergy is too small to support large-scale biomass electricity. Companies such as Drax and Enviva routinely describe whole trees as ‘residues’ or ‘low-value’, just because they have been cut down before growing to full size or because they have grown crooked rather than straight. Furthermore, most biomass power stations, including all current and future UK projects, cannot burn residues for technical reasons; they have a high bark content, which can cause corrosion of boilers. Drax’s technical report confirms this is the case. The Convention on Biological Diversity and its Aichi Target require all member states (including the UK) to reduce or phase out subsidies that are harmful to biodiversity. There is strong evidence that UK subsidies are contravening these targets with subsidies for biomass electricity. Additionally, biomass electricity has a negative impact on air quality and peoples’ health. Biomass power stations emit large quantities of nitrogen oxides (NOx), sulphur dioxide (SO2), carbon monoxide (CO) and small particulates (PM10, including PM2.5), as well as a range of other pollutants. Overall, biomass plants emit a similar range and volume of pollutants to coal power stations, albeit more of some pollutants and less of others; more Volatile Organic Compounds and small particulates, but less sulphur dioxide and mercury. 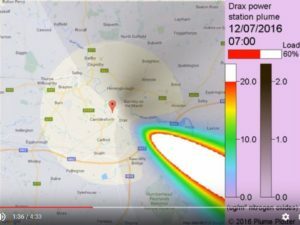 Since half of Drax’s units were converted from coal to biomass, emisions of small particulates (PM10) have increased by 135%. The effects of air pollution on health are well accepted and documented. Air pollution is estimated to cause 40,000 deaths in the UK every year, from heart attacks and strokes, cancer and lung and respiratory diseases. The World Health Organisation has collated detailed evidence on the effects of air pollution on health. The pollutants from biomass power stations are linked to a range of health conditions, from childhood asthma and bronchitis, to lung disease, cardiovascular disease, cancer and developmental problems. In 2015, the UK Government introduced sustainability standards for biomass electricity. Many environmental groups, including Biofuelwatch roundly rejected these standards as insufficient and not based on science. The current greenhouse gas criteria states that biomass electricity may qualify for renewable electricity subsidies if it has a carbon intensity of 200 kg CO2e/MWh or less. Firstly, this is far higher than other renewable sources (e.g. wind, 4-31 kg CO2e/MWh). Secondly, the method used to estimate the carbon intensity by and lare only includes emissions from burning fossil fuels during logging, processing and transport of the wood but ignores all other sources of emissions (as listed in the first section). Ignored are the smokestack emissions from burning biomass and those from cutting down trees and entire forests. Even sources of biomass which a report published by the Government in 2014 describes as resulting in more carbon emissions than coal for a period of several decades are classified as being ‘low carbon’ and thus eligible for subsidies. The land criteria for biomass are even weaker than the greenhouse-gas criteria. Only 70% of the wood burnt by a power plant must be classed as ‘sustainable’ in order to qualify for subsidies. The ‘sustainable’ criteria themselves are vague and based on principles rather than measurable standards – for instance, ‘protecting water, soil and biodiversity’ and ‘conserving key ecosystems’. Furthermore, wood pellet providers are permitted to provide their own evidence of compliance with these standards – external verification and auditing is not required. However, no sustainability standards will overcome the fundamental problem with biomass: the demand for burning wood is simply too high. There is a miniscule volume of waste wood that could be burnt and represent a true emissions saving and not damage biodiversity compared to the current demand for biomass for electricity. It is simply not possible to replace a significant portion of fossil fuel burning with biomass burning. UK policy should reflect this by not subsidising biomass and setting stringent caps on the total biomass capacity in the country. Furthermore, while the capital cost of solar and wind power continues on a downward trend, there is no realistic prospect of biomass electricity costs coming down because combustion technologies are already mature, and because increasing demand for wood cannot possibly result in wood becoming cheaper. Stopping biomass subsidies and diverting them towards sensibly sited wind and solar projects, as well as energy conservation and efficiency would help to significantly reduce carbon emissions from the energy sector. Support for new onshore wind and solar PV, and increased support for community renewables wind and solar projects, and for home energy conservation are vital and viable alternatives to coal, biomass and gas electricity. In 2015, instead of supporting a move to a different energy system we so desperately need, the government massively cut support for low-carbon technologies. Slashing the Feed-in-Tarriff (FiT) – which is only available to projects below 5MW – by 65%. This will hit community renewables and solar PV especially hard. £100 million over 3 years may sound a large number initially, but it is disproportionately small compared to the yearly support for biomass electricity (£817 million last year) and for North Sea Oil and Gas (tax cuts worth £1 billion to the public purse in 2014-2015 alone). The government have no national energy efficiency targets, and scrapped their commitment to zero-carbon homes and the Green Deal. (Whilst the Green Deal had failed in its objectives, it was not replaced with a more meaningful scheme). The government estimated the cuts are likely to result in 1.6 million more tonnes of CO2 being emitted. 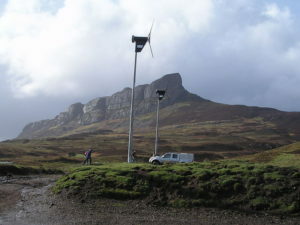 These cuts went ahead is despite the urgent global and national need for emissions reductions, and despite the growing success of community energy: community energy projects were spreading around the country, creating more localised forms of investment and economy and revitalising communities. Furthermore, as mentioned above, the costs of wind and solar are expected to continue to fall. We desperately need to be moving away from old, inefficient, polluting and extractive technologies (such as oil, coal, gas and biomass) and towards a decarbonised energy system. There needs to be proper support for truly low-carbon renewables, but also, this can’t exist in a vacuum: there must be a well thought-through and holistic plan for transforming the energy system of this country, including reducing energy demand, massively updating the grid and storage, and investment in low carbon infrastructure – the list goes on, and it requires proportionate research and support. This also must be an energy system that works for the people of this country, being affordable and delivering warm homes, transport links that function and clean air to breathe. 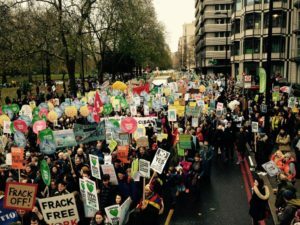 Biofuelwatch supports the Reclaim Power declaration and works with community renewable energy projects and campaigns, as well as providing information to the Government, MPs and other decision-makers.